Boil eggs on medium heat for 10 minutes. Remove, cool, peel, and cut in half lengthwise. Remove yolks and place In a medium bowl. Then add pesto and mayonnaise to the yolks and mash with a potato masher. Add shallots, olives, parsley, capers, and shrimp. Stir to combine. Season with sea salt and black pepper. Drop teaspoonfuls of the egg yolk mixture into the egg halves, then add shrimp on top (refer to picture). Drizzle with extra virgin olive oil and sprinkle with paprika. Refrigerate until it's time to serve. I love deviled eggs! These sound absolutely, over the top good! 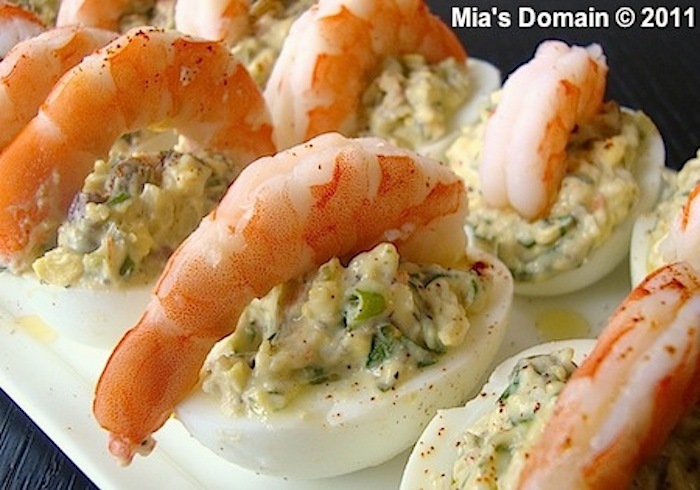 Mia you make deviled eggs look spectacular! wow. You are such a genius with food. this was one of those recipes. Awesome idea Mia. I definitely need to try that!! What an amazing idea...I bet these are absolutely delicious! Thank you so much! It was very good! OMGoodness Mia!!! These look totally awesome! My problem is I need to make about 2-4 dozen just for us and the kids... and they won't last but a few seconds! LOL This is a must have/must fix! Thanks! You rock!!! Skip the olive oil, spoils the taste, and use spicy Hungarian paprika. Other than that is it a rather nice way of doing eggs. Delicious, just made them for my wife and I tomorrow for lunch; had to test drive a couple,...........mmmmmmm.